wrote F. Scott Fitzgerald. Yeah, they can afford to spend four god-damned dollars on a glass of Orange Juice! 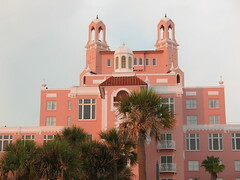 This is the Don Cesar in St. Petersburg Florida. F. Scott Fitzgerald stayed there once many years ago and I stayed there for three days last month. If I ever get a fortune to rival Jay Gatsby's I might visit again. But four dollars...... Jeez! the straw of her Juice. She slides the juice over to him. He slides the juice back. That's right BAMF! I forgot about that scene from Pulp Fiction. If the Don Cesar had played "Rumble" by Link Wray in the background my orange juice would have tasted much better.